H and χ Per are a well studied double cluster exhibiting a rather spectacular sequence in an V, V-I CMD. 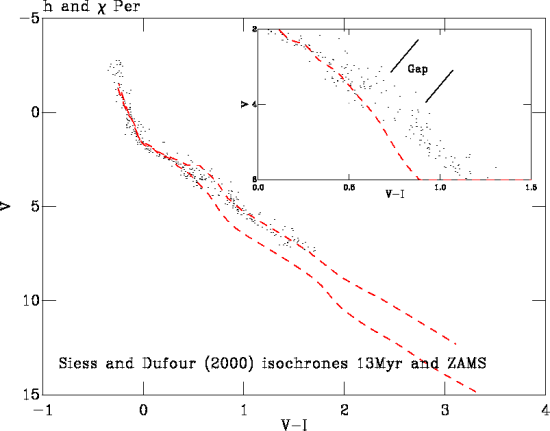 In Mayne et al (2007) we selected a circular region around central coordinates of each of the clusters (found through tracing the high mass stars in the main sequence) to aid selection of the correct sequence. Then we combined the CMDs of h and χ Per by applying a shift in extinction of AV=0.157 to h Per bringing the clusters to the same extinction. An empirical isochrone was then fitted to this combined catalogue, after a photometric cut, and the resulting isochrone compared to others on the relative age ladder. In Mayne et al (2007) we use h and χ Per as a fiducial and adopt an age of ~13Myrs, but also more interestingly find clear evidence for an R-C gap feature separating the MS and PMS parts of the sequence, this can be seen in the figure. In Saunders et al (2009) we searched for variable stars in h Per to identify the radiative-convective gap.